Niall McCann has had a whirlwind of a career. When researching his background prior to our interview, there were so many different aspects to consider that I could have chatted with him for hours! He’s been on multiple expeditions, completed a PhD, filmed documentaries, and even broken his back whilst speed flying; there’s no denying that Niall is a motivated individual. To top it all off, he’s now busy working as the Conservation Director for his impressive conservation charity, National Park Rescue (more), which is pushing to save a critical region in Africa suffering from severe poaching. This blog post delves into how he got to where he is whilst giving readers top tips on how to do a PhD, go on research expeditions, and even how to get on TV! National Park Rescue sounds fantastic. Tell us more! National Park Rescue has recently begun a large-scale conservation operation in a Zimbabwe national park which has lost all of its rhinos and 75% of elephants due to the poaching epidemic. Furthermore, the area has lost its tourism trade, with only around 100 visitors a year, most of which are from wildlife organisations. The charity has raised a lot of public awareness and is backed by lots of high profile individuals such as Sir Michael Caine and the late Sir Roger Moore. The charity is focusing on saving some very charismatic species (who doesn’t love elephants?) which makes it easy to market, but it really is vital. We are currently working on a documentary called ‘the final shot’, which show that despite £billions being donated to charities, Africa’s national parks remain massively under-resourced danger zones for wildlife. Securing the wildlife left alive is often the forgotten priority among the well-funded conservation organisations, who are all-too-often focused on attending conferences and writing reports. You’ve had a very successful career in conservation. Can you give us some general ‘top tips’ on how to get into a career in conservation? Go on expeditions, and not necessarily arranged ones. I independently raised money and arranged one to Bolivia during University, where I studied giant otters. You can often find funding from various organisations, for example my Bolivia trip was funded by the RGS, Rotary Club, and a Bristol University grant. Doing these expeditions led to TV production companies noticing me, and organising it myself set me apart from other people. Nowadays it’s a good idea to have a Youtube channel; many of my friends have entered TV in this way. Competition is so great that you need to have something unique; you need to try to differentiate yourself from the pack. Volunteering is vital – I was constantly volunteering on local wildlife projects when growing up, and then started to look abroad for other opportunities. Most wildlife organisations are always looking for volunteers so there is plenty of choice; as an example, I volunteered between my AS and A levels in Italy on a wolf project for the CTS and spent over 4 months volunteering in Mauritius immediately after my A levels for the Mauritius Wildlife Foundation. More local volunteering is also a great way to build experience! Constantly build your CV and take every opportunity; you really do make your own luck. Niall McCann – Conservation Director of National Park Rescue. How did you get into wildlife TV presenting? Throughout my time at university and the years immediately graduated I came onto the radar of the media as I was doing lots of high profile activities. Production companies will learn your name, and eventually something may stick. My first show was a documentary about an explorer who went missing in the 1920s, and off the back of that I secured two seasons of the ‘Biggest and Baddest’ (I really don’t like that name!). Nowadays using social media platforms such as Youtube give you much more ability to advertise yourself; vlogs can help you to attract a following and get you noticed. I got to travel a lot through my television work and lived the life most biologists dream of. I got charged by tigers twice, I got to catch crocodiles with rehab groups, dart lions, and work with gorillas. I wasn’t ever remotely scared, just exhilarated; it was all awesome stuff and it was pushing a conservation message the entire time. 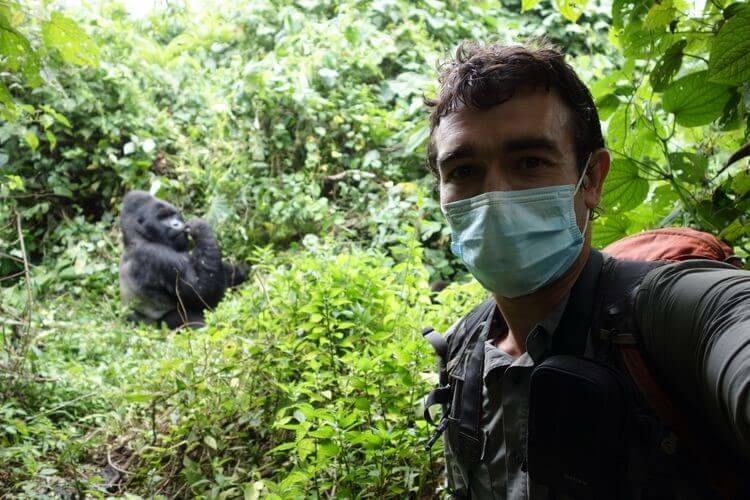 However, nowadays, I am focused on my charity and direct conservation work, which is far more important than television – although filming for TV is great fun, you are not actually doing any real hands-on conservation, and I want to actually do something myself, not just be a mouthpiece for conservation. Were you naturally comfortable in front of the camera, or did you need training? It is an odd experience, but I was lucky in that respect as I’ve always felt quite comfortable. To begin with you feel unnatural but making your own home videos is important for becoming more familiar with being in front of a camera. For the first documentary I made, I imagined speaking to my friends/family whenever I was on camera. Nowadays, it’s just like speaking to another person! You’ve also got a PhD; do you have any insights to share about how to go about embarking on one? I took a 5 year gap between completing my undergraduate degree and doing a PhD because I wanted to make sure it was the right thing to do. At that point I was considering a career in academia (although I later realised it wasn’t my forte as I prefer focusing my energy on direct conservation). However, in my opinion, having a PhD is very useful even if you don’t continue into academia. Having the title ‘Doctor’ has strengthened my credibility in meetings, particularly with my current work where we meet with governments, diplomats and other senior National Park stakeholders in Africa. My biggest tip for choosing a PhD is that it doesn’t matter which University you go to, what matters is having the right supervisor and the right subject. I once rowed across the Atlantic ocean. It took 16 months of preparation, and then 63 days on the expedition. We lost all communication 7 weeks in, which was very stressful for our friends and family, and wasn’t pleasant for us either: not being able to communicate with the outside world for 2 weeks while being pounded by extremely heavy seas. I also went to a place in Honduras where no non-indigenous person had ever been before. It took over 2 days of cutting through the rainforest to reach where we wanted to be, then we camped and surveyed the area for 8 days before returning to civilization once more. On that trip, we saw monkeys that had never seen another primate; they go crazy when they see a bipedal human for the first time! You were in the press a while back because of an accident you had whilst on an adventure. Can you tell us more? Two years ago I had a very unpleasant accident and broke my back in a speed flying accident. I was in hospital for 38 days. I have a replacement vertebra, and was told I might never walk again. I’ll never fully recover due to spinal cord damage, but I have made a remarkably good recovery. Since the accident, I’ve been on multiple field trips to southern Africa and one to Honduras, so I haven’t allowed it to affect me as much as it could have. I’ve also joined Brecon Mountain Rescue Team, the team that rescued me, and this has provided a wonderful focus for my recovery and enables me to give something back to the outdoor community. A huge thank you to Niall McCann for allowing us to interview him. If you would like to find out more about his charity, National Park Rescue, please click here.